Tamil Nadu government on Tuesday sought a Central grant of `5,776 crore to implement various developmental projects. CHENNAI: Tamil Nadu government on Tuesday sought a Central grant of Rs 5,776 crore to implement various developmental projects. It also sought special exemption from conducting ‘mandatory’ public hearings for certain projects of public importance. 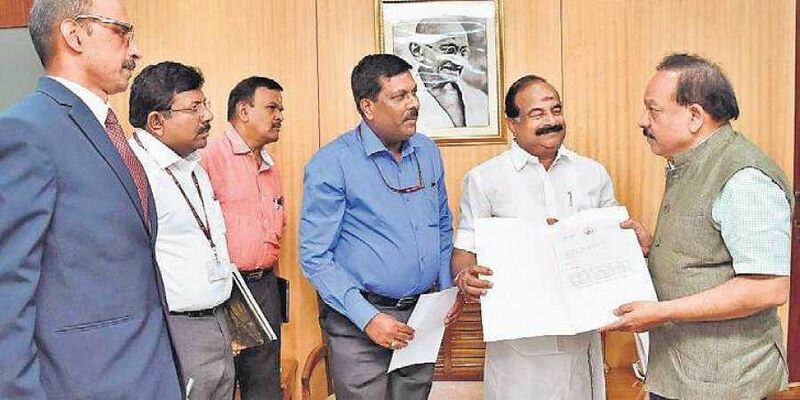 State environment minister KC Karuppannan along with senior bureaucrats met Union Minister Harsha Vardhan, who holds environment, science and technology portfolios, in New Delhi and submitted a detailed memorandum. In a 14-page representation containing 13 requests seeking for in-principle clearance, the government said Tamil Nadu Pollution Control Board was facing several difficulties for smooth conduct of public hearings, which are mandatory under Environmental Impact Assessment Notification, 2006, for certain type of projects. “The public, NGOs, representatives of political parties with vested interest disturb the smooth proceedings of the hearing. In some cases, the hearing was stopped in the middle and meetings were cancelled. In such cases, second time hearing was conducted with heavy police protection. Hence, some projects are getting delayed and for some projects permission could not be accorded. Due to this, investors faced heavy loss. Therefore, it is requested that for public importance infrastructure projects implemented by the government like Common Effluent Treatment Plants, Common Municipal Solid Waste Management Facilities, Common Hazardous Waste Treatment Storage Facilities, Oil & Gas transportation pipe line projects, the Union environment ministry may consider for issue of environmental clearance without insisting for conducting public hearing once again,” the memorandum reads. Shambhu Kallolikar, TNPCB chairman and environment secretary, who accompanied the minister while submitting the memorandum told Express that the government did not ask blanket exemption. “As Tamil Nadu is becoming more urbanised and industrialised, the problem of managing solid and hazardous waste is becoming a huge challenge. So, we need to have more plants to treat the waste and can’t wait for clearances to come,” he said. TN has 12 corporations, 124 municipalities, 528 town panchayats. The total generation of municipal solid waste from urban local bodies is 14,746 tonnes per day, of which Chennai alone generates 5,400 tonnes. To convert waste into energy, the government has requested Rs 3,500 crore grant to establish waste to energy plants as is being done in countries such as Japan and Singapore. Meanwhile, the government has sought Rs 40 crore to increase the green cover in Chennai, industrial campuses and along national and State highways. A Udhayan, Director, Department of Environment, said a request was made to formally approve Coastal Zone Management Plan, besides approval for projects under Green Climate Fund.